Articles by Wendell Tenison tackling controversial topics including Sabbath observance, Holy Spirit baptism, fivefold creation, and tongues. Help for Apostolics and Oneness Pentecostals to learn the truth about the nature of God, salvation, and Christianity. investigative site dedicated to help people who search for the truth about 9/11. Trudeau, in The Non-Euclidean Revolution, argued for his 'Story Theory of truth' as opposed to the traditional 'Diamond Theory of truth'. This site defends Plato and diamond theory against postmodernists and story theory. a non-denominational group of young people dedicated to stopping abortion, affiliated with show the truth canada. A site based on texts by Rhys Evans, which state his views on life. Texts were taken (with permission) from two pamphlets, which he wrote. Discussion about the personal search for provable universal spiritual truth (gnosis). You are invited to join in the search for that truth. Examines life, truth, war and the cure for human troubles. This site is dedicated to the spreading of the truth about Islam. It contains a general introduction and articles on the Five Pillars of Islam. Group dedicated to creating a memorial statue to honor Sojourner Truth and her work. Offers history, quotes, and newsletter. Dispensational Truth, from the Acts 28 perspective, distinguishes between the blessing, 'The meek shall inherit the earth', and those blessings which are spiritual, to be enjoyed 'in heavenly places'. Wisdom quotes, Bible verses about truth and love, sermon aids, stories about the devil, and descriptions of false Christians. Features PDF etexts of J.A. Wylies 'History of Protestantism, Vol. 1', Hagstotzs 'Heroes of the Reformation', MCries 'The Life of John Knox', DAubignes 'The Protector', Wilkinsons 'Truth Triumphant'. Providing truth on TeenScreen mental health screening programs by presenting information found on the Internet. Helping you to connect the dots leading to the link between TeenScreen and the pharmaceutical companies. 23 Yahwehs Philadelphia Truth Congregation Loganville, Georgia. Correspondence between Wilfrid Sellars and Gilbert Harman on truth. Illuminating discussion on the issue of whether a Tarskian semantics provides an adequate basis for a correspondence theory of truth. Jehovahs Witness Truth about the Bible and the Watchtower, also information about the founders of this religion and other important Bible References. offers recent environmental evidence that curtails the 'consensus' global warming view through the current years annual report, 'index of environmental indicators - xxxx' and the short documentary (48 minutes) motion picture, 'an inconvenient truth...or convenient fiction?' - staring dr. steven hayward. The Violent Truth behind the Sufi Mask. If the business hours of The Whole Truth in may vary on holidays like Valentine’s Day, Washington’s Birthday, St. Patrick’s Day, Easter, Easter eve and Mother’s day. We display standard opening hours and price ranges in our profile site. We recommend to check out thewholetruthnow.com/ for further information. 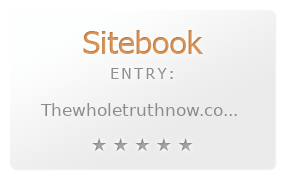 You can also search for Alternatives for thewholetruthnow.com/ on our Review Site Sitebook.org All trademarks are the property of their respective owners. If we should delete this entry, please send us a short E-Mail.